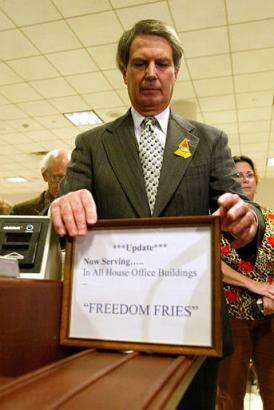 Today, congressmen will eat Freedom Fries in the House of Representatives’ cafeteria, and all I can do is laugh nervously. ps: I’m going to be posting the links with which I would normally assault my friends on AIM here instead. The ratio of text to pictures is going to go down, but hey, no more link spamming. Previous Previous post: OMG DRAMA!